A recent study by the National Association of Realtors found that 92% of homebuyers use the internet to search for a home, including homes for sale in Northampton, MA. It’s a powerful tool that you should use, and use wisely. One of the best ways to get people to come to your open house is by promoting it as early and as widely as you can on the Internet. Try to plan your open houses at least a week in advance. Post the information on Realtor.com, Zillow.com, Trulia.com, and the MLS. Facebook and Twitter are also great ways these days to get the message out, as is blogging about the open house on your website. As most buyers begin their searches online for homes for sale in Easthampton, MA or anywhere else, it’s important to have a professional representation online; this means you should post more than a handful of pictures, make sure the photos are excellent quality, and make sure the photos show the home at its best. This is not an outdated practice; signs really bring people in. Not only do signs help homebuyers who planned to come to the open house, but they also attract those who aren’t actively looking for a home. These people may become your buyers; if not for this home, then perhaps one in the future. This may go without saying but don’t underestimate the power of friendliness or going out of your way to help people who come to your open house. Consider doing something helpful like mapping out all the other open houses in the area, regardless of who’s listing the homes. Not only do visitors appreciate this, but it establishes a professional relationship with other realtors. Some agents pass out flyers to a few dozen of the closest neighbors to invite them to the open house. Many offer food and drinks. These are gestures that don’t go unnoticed and can build relationships and trust with potential buyers. Consider going a step further and having a special event for 10 or 15 of the home’s nearest neighbors. Offer wine and cheese or other finger foods, and be friendly and socialize. You can get to know the neighbors and you can help foster a sense of community between them if they don’t already know each other. Hosting an open house can really bring in business, especially if done the right way. Use the Internet to promote the open house, make sure you put out multiple signs to draw attention to it, and be friendly and go above and beyond to provide good, professional service to visitors. You can be assured that the team at Taylor Real Estate, which serves Greater Easthampton, Northampton, and the surrounding areas, will host an excellent, professional open house for you. Contact them today! 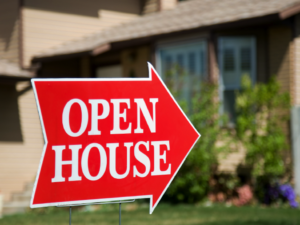 Here are three tips for hosting a successful open house. Hosting an open house can really bring in business, especially if done the right way. This entry was posted in Real Estate Advertising and tagged Buying and Selling a House, First-Time Seller, Home Sellers, Home Selling, Home Selling Tips, Hosting an Open House, How to Sell a House, How to Sell a House Fast, How to Sell a House Quick, How to Sell House Quickly, How to Sell my House, How to Sell your House, How to Sell your House Fast, How to Sell your House Quickly, open house, Property Selling, Quickly Sell House, Real Estate, Sell a House, Sell a House Quick, Successful Open House, Taylor Real Estate, Tips for Hosting. Bookmark the permalink.